The local chain's new Grant Park location on NE Broadway offers a bit of nostalgia by the slice. New Seasons Market has opened its 15th location on NE Broadway in the Grant Park neighborhood, and the November 12 grand opening unveiled two new store concepts—juice and toast bars. Hopping onto the artisanal toast bandwagon, the local grocery store chain now offers customers made-in-Portland and in-house spreads atop thickly sliced, warm and hearty toast. So why open a toast bar, and why now? Jamie Powell, New Seasons’ Director of Prepared Foods who first spotted fancy toast in its birthplace San Francisco, shared with us the inspirations behind the concept. The market's initial concept responds to Grant Park's crowds of high schoolers, grade schoolers, and busy parents looking for quick, simple breakfast options for the whole family. Artisanal toast may be dessert lookalikes or savory meal stand-ins, depending on the topping and bread, but New Seasons keeps it on the sweet side with fixings that lean towards breakfast flavors. “We wanted to keep the idea of toast toppings simple,” says Powell, so as not to confuse the boundary between sandwich and toast. 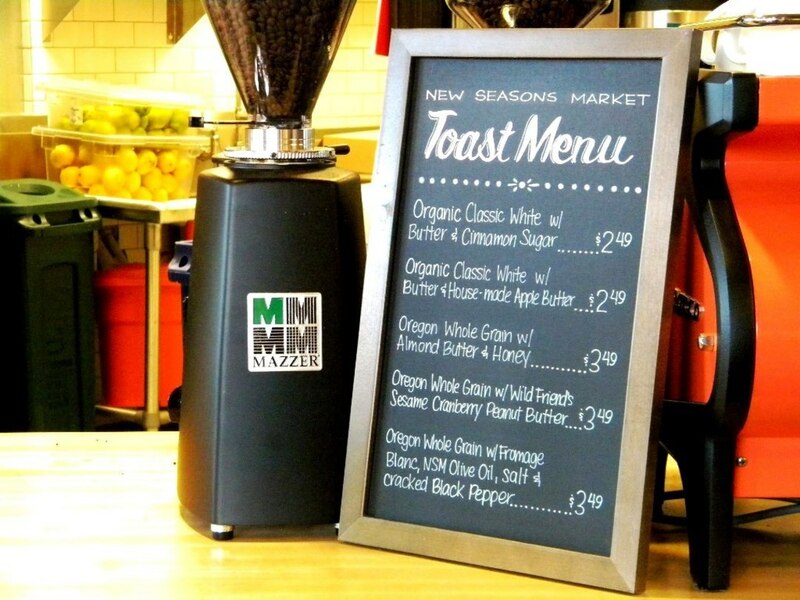 The toast bar currently serves up four menu options. 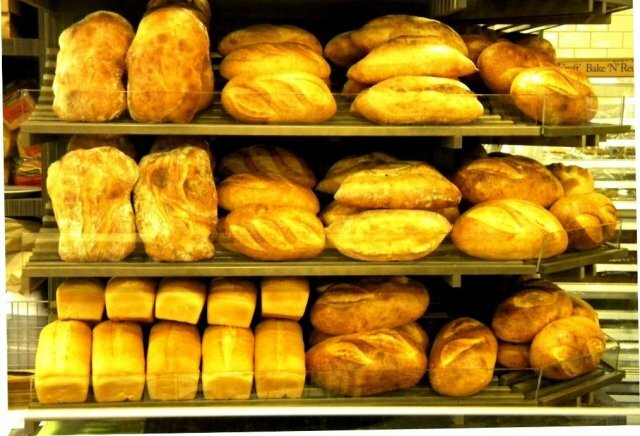 Shoppers can choose between organic classic white bread or Oregon whole grain. Toppings include butter and cinnamon sugar, butter and house-made apple butter, Wild Friends almond butter and honey, sesame cranberry peanut butter, or fromage blanc with NSM olive oil, Jacobsen sea salt, and cracked black pepper (servings start at $2.49). As the seasons change, toast toppings will also rotate; eventually the toast bar may offer more savory options for an afternoon munch. All breads and toppings at the toast bar are made and sourced locally. Bread used for toasting is special to New Seasons, made with Oregon-grown grains milled locally at Cama Country Mill. Rye, barley, whole wheat, and cracked wheat flours are packed into a hearty loaf, while a more basic white sandwich bread caters to those seeking nostalgic comfort. A slice slathered in nut butter or jam is also a nice alternative to bagels and cream cheese, as Jamie pointed out. The juice bar, located adjacent to the toastery, is also new to the Grant Park New Seasons. Packed with fresh, colorful produce, the bar offers five raw juices and five smoothies. 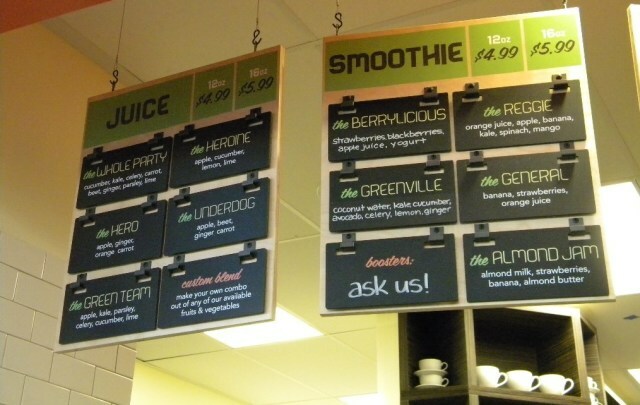 Shoppers can also customize a mix of fruits and vegetables to juice or add boosters to smoothies. The toast and juice bars have in the works at the New Seasons HQ for a while, and similar offerings may pop up at other markets in the future.